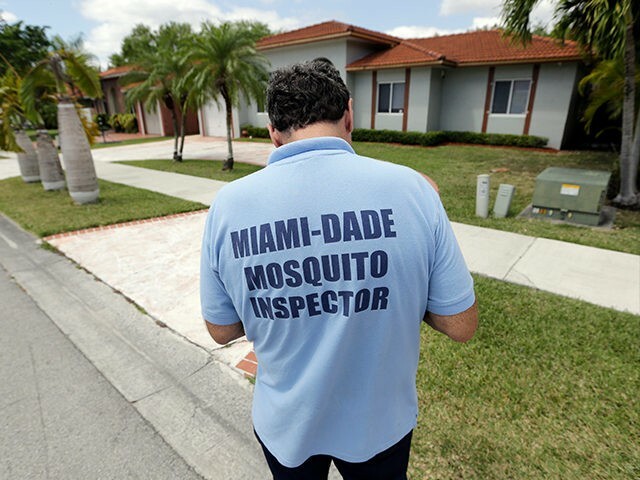 Miami-Dade County officials have announced that they will use aerial insecticides in affected neighborhoods of Miami to combat the Zika virus, though such measures are typically only marginally effective in killing aedes aegypti, the mosquito responsible for carrying Zika. The number of mosquito-contracted local cases of infection has now risen to 15. Reuters reports that the spraying occurred at dawn Wednesday and covered a ten-mile radius around the northern Wynwood neighborhood of Miami, where most cases have been diagnosed. The chemical Naled, typically deployed to combat mosquitos and larvae, was used – a chemical experts say is “pretty safe stuff” to the environment, the Miami Herald notes. Officials chose to attempt the spraying campaign despite it not being as effective against aedes aegypti as it is against other insect species. Aedes aegypti prefers to spawn in covered shallow pools of water, difficult to reach by aerial spraying. The areas it does reach, however, could experience a significant decline in the mosquito population. In addition to Zika, aedes aegypti mosquitos, identified by their striped legs, can carry Dengue, Yellow Fever, and Chikungunya. In Florida and most of the world, this is the only mosquito known to carry Zika, though Brazilian researchers recently discovered that the more common culex mosquito can also carry Zika. Brazil is the epicenter of the Latin American Zika epidemic that began in February, the heart of the Southern Hemisphere’s summer. In addition to the aerial spraying campaign, the city is handing out free mosquito repellant to its homeless population. The Herald notes that getting them to use it may be a challenge, however, as Zika poses the greatest threat to pregnant women and unborn children, and many homeless people are not concerned with having children. The newspaper quotes one individual, Antonio Price, who was “thankful” but did not seem eager to spray himself down with insect repellant. An estimated 80 percent of those infected with Zika do not exhibit symptoms, and the 20 percent who do often experience only mild aches, rashes, and conjunctivitis. Zika poses a threat to pregnant women because scientists have found it can case major neurological deformities in unborn children, most commonly microcephaly. Microcephaly is a condition in which an infant’s skull is too small for his or her brain, crushing the brain and severely damaging cognition. The U.S. Centers for Disease Control (CDC) is encouraging everyone in the area to use insect repellant, and issued an “unprecedented” call to pregnant women to stay away from the affected neighborhood. Zika experts warn that, without repellant, the number of Zika carriers could multiply exponentially and spread to different regions of the country. “DEET [an insect repellant] should be Miami’s new perfume,” infectious disease expert Dr. Matthew DeGennaro told CBS. Miami has documented 15 cases of Zika contracted through a mosquito bite occurring in Florida. It has also documented hundreds of cases of individuals traveling abroad to Zika-infected areas and testing positive for the virus upon their return. Zika is transmittable through sexual contact. Fourteen of the fifteen local cases occurred in the Wynwood neighborhood; alarmingly, it is the latest case that occurred outside of the neighborhood CDC officials are warning against visiting. Miami is the first area in the continental United States suffering from a mosquito-carried Zika infestation. The commonwealth of Puerto Rico is suffering from a significant outbreak – many of the cases of travelers bringing Zika home to the mainland from Puerto Rico – but the CDC has been unable to convince local officials to use aerial spraying techniques to diminish the aedes aegypti population. According to Reuters, officials are concerned “about its impact on health, bees, agriculture and the environment,” though officials say the Naled insecticide is safe to spray in populated areas.